On Saturday, May 19th, the Down Syndrome Association of Delaware will celebrate their 15th annual Buddy Walk® at Silver Lake Park in Middletown, Delaware. 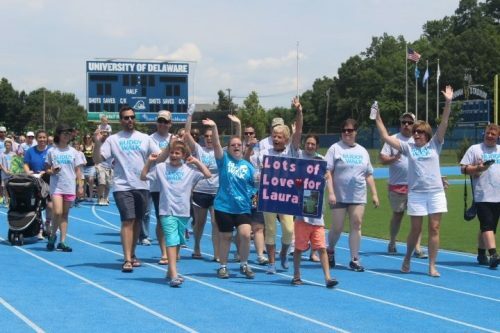 A family event that also brings awareness to the community, the DSA of Delaware Buddy Walk® has fun for everyone, including games, crafts, dancing, raffles, and a silent auction. The event is not only for the Down syndrome community, but for the community at large to attend. Lauren Camp, the organization’s executive director, shared that “there is a common misconception that you have to be connected to the Down syndrome community to attend.” Rather, the DSA of Delaware hopes that everyone in the community will attend their annual celebration. Lauren came to the DSA of Delaware as a volunteer when she was a high school student, because a teacher (and mother of an adult daughter with Down syndrome) recommended the organization. Lauren volunteered for many years, and when she was finishing up her undergrad degree, she became the part time program director. After Lauren received her master’s degree, she became the Executive Director of the DSA of Delaware. In all, she has served the organization for almost 10 years, both as volunteer and employee. One of her first accomplishments occurred when she was senior in high school; she started a summer camp program for kids and now 100 campers participate annually. The program recently expanded in Delaware because of its popularity. Lauren will be presenting at the 2018 DSAIA Leadership Conference about the camp so that other organizations can learn how to start a similar program. Lauren started working with the National Down Syndrome Congress as the Kids’ Camp Director eight years ago, and now she serves on the policy team for NDSC as well. This year marks the walk event’s 15th year, so the DSA of Delaware will be celebrating this milestone! The walk has seen some changes throughout its 15 years. The first 14 walks were held at the same location, and for 13 years the walk was run by Coleen Popp, a dedicated volunteer to the organization. Lauren expressed her gratitude to the Popp family for their years of dedication to the event. Kimberly Finn Curran now serves as the co-chair for the Buddy Walk® Committee and has brought a lot of organization, energy, and best practices to the event. Lauren has loved working with Kimberly and the rest of the dedicated Buddy Walk® committee. Last year, the committee focused on successfully executing a walk event without their seasoned leader, and once they saw that they could do it on their own, they made the decision to move to a new location. This move has enabled the committee to secure strong corporate sponsorships, so the committee is already seeing the positive aspects of changing their location. For the first couple of years, their Buddy Walk® events were small, but they continue to add more elements to the event (a resource area, kids’ play area, crafts) and the walk has grown each year. While some aspects of the walk have changed, several have been consistent over the last 14 years. The organization has always encouraged families to form teams honoring their loved one with Down syndrome, and the walk itself has always been the keystone of the event. The DSA of Delaware also sets up a tent each year, to provide information to their membership’s families and to welcome new families to the event. Members look forward to the spirit of the event (in that everyone is happy to be there, enjoying themselves), as well as spending time with friends and family who they may only see at the Buddy Walk® each year. The DSA of Delaware works with the Down syndrome clinic at the local children’s hospital, and they gage the interest of new parents and parents new to Delaware in terms of participating at the walk. Often, their personalities can determine how they handle the diagnosis and how engaged they will be at their first walk. New parents are encouraged to attend the walk and at least observe if they aren’t quite comfortable jumping in right away as fundraisers. Some families have huge teams, and others choose to simply attend as a family – either is welcomed! The DSA pairs them with a Buddy Walk® mentee, so that they have someone to hang out with on that day, and get ideas on what to do the next year and how they can prepare. The new families are also greeted by the DSA staff or board members upon their arrival to the walk. So many memories are made each year at Down syndrome walk events, but Lauren’s favorite memory is from last year, when two of their self-advocates led the opening ceremonies and acted as the event’s emcees that day. They started the walk, made introductions, and were the faces of the event. “It was a great experience, and we are definitely doing that again,” Lauren shared. How great for new families to see self-advocates in this role! 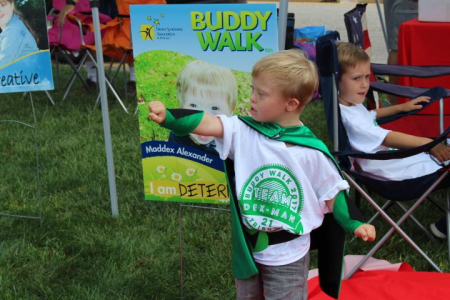 The DSA of Delaware Buddy Walk® is the organization’s biggest fundraiser. The funds raised allow the organization to serve their Down syndrome community with programming, events, new parent groups, outreach initiatives, and educational support. Everyone in the community is welcome to attend this fun family event! The DSA hopes to spread the word that families do not need to have any ties to the Down syndrome community to attend the walk and enjoy all the activities. To show your support for the Down Syndrome Association of Delaware and their 2018 Buddy Walk®, please visit their fundraising site at http://www.ds-stride.org/delawarebuddywalk. To learn more about the DSA of DE, please visit http://dsadelaware.org.